Donlan’s Fish & Seafoods is 97 years old and one of the oldest businesses in Flint Michigan. But don’t call us old-fashioned...you can now find us on Facebook and Twitter! Which is better - king crab or snow crab? King Crab - Customers love the size of our legs which can weigh 1-2 lbs each and are about the length of your arm. They make an impression for your guests and are big enough to share. First time customers sometimes worry they don't have a pot big enough - but you don't have to break these beauties to cook them. Preheat the oven at 350-400 degrees, places the legs in a baking pan with an edge, put water in the bottom and cover with foil so they steam. Takes 10-25 minutes depending on the size of the legs and claws. You are just trying to get all the ice crystals off and make them warm enough to eat. Snow Crab - Sweet and salty crab meat that pleases everyone. The biggest complaint about the snow crab is that it's "too much work." Not with your legs! Our snow crab clusters are 10+ ounces each while the ones in restaurants are usually 3-5 ounces so you get a lot of bang for your buck. Our favorite way to prepare is a big pot with a little steaming water, throw the crabs in, and cover. Some like to add Zatarain's Crab Boil or Old Bay for some spicy flavor. You know they are done when the legs turn orange and are bendable with all ice melted off. 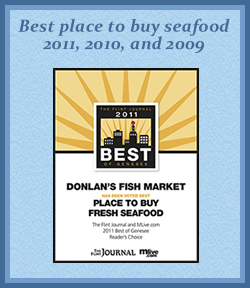 Have a question for the Donlan's Fishmonger, go to the Contact Us section and send it in.